It is my honor and my calling as a non-fiction book coach to help a great many people including business and community leaders transform their experience into a story that moves people to action. I am a believer that the wisdom and power to create real change is trapped in the minds and experience of leaders, community builders, and everyday people all over the world. As a book writing and publishing consultant, my role is to connect people like these, who have solutions for the world’s problems, with the people who need those answers. I do this by coaching them to write a nonfiction book that makes an impact – a book that will give them a broader platform to share those ideas. Your story deserves to be told–and I believe it’s your responsibility to tell it. Most aspiring authors don’t know how to get started on their book and feel overwhelmed before they even begin. Below are some tips & tools, including some I’ve developed for you, which will help you share your truth. A book about your life, or a memoir, captures a period of time or a set of events in your life, rather than cataloging your experience from cradle to grave, as in an autobiography or biography. In order for your memoir to appeal to an audience beyond your friends and family, you must develop a solid concept that bridges the gap between your life and that of your reader. Publisher Sharlene Martin once said, “[Your memoir] needs a solid concept for the book that invites the reader’s concerns into the experience of reading it, instead of just saying, ‘Let me tell you all about wonderful me.’” Consider the elements of your story that are universal and find ways to write them that invite your reader to imagine and consider their own life through the lens of your circumstances. You can make your nonfiction book as memorable as its fictional counterparts by using sensory language–language that conveys how you felt, what you saw, heard, smelled, and tasted during the scenes you present. I encourage my writers to close their eyes when they write a pivotal scene to take themselves back to the place, the time, and the emotion of the moment. Once you’ve transported yourself back to that moment, open your eyes and write your scene. When you’ve gotten it down on the page, go back and look for ways to vary your language to make it richer and more interesting. Break out your thesaurus if that helps! What are you waiting for? 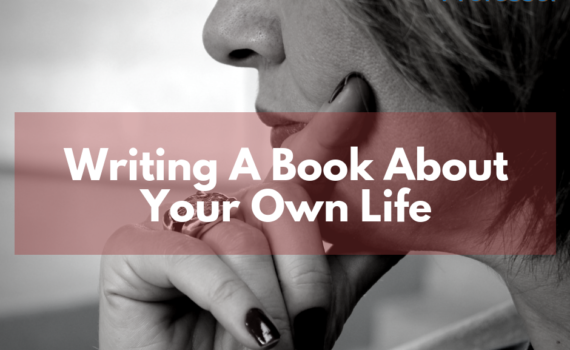 What better time is there to write a book about your own life than now? Someone needs your message today. When you share what you know and what you’ve learned, you become the solution. The answers are trapped inside of you; please don’t keep them to yourself. You ARE the solution and your story is exceptional! Contact us today to get started your book!